Excessive running last week had dislocated my knee cap and it hurts. BADLY. And then I go and watch the gorefest Brothers where bones are crunched mercilessly, shoulders are broken pitilessly, causing a relationship between my palm and knee. It's still caressing the broken joint!! Brothers was made by putting the DVD of Warrior in a Xerox machine. Alas the paper got stuck, the Xerox machine's ink expired and what came out was a bad, melodramatic, manipulative, painfully long version of the original. Papa Gary is cranky. Cranky has two sons, Grumpy (David) and Grouchy (Monty). Grumpy is a Physics teacher. Grouchy is... ummm... just grouchy. And besides being forever upset, they have one more thing in common: they all are fighters. The first half establishes the characters. Cranky was a fighter who destroyed his life and family by excessive drinking. He even strays in marriage. His wife is Maria, played by Shefali Shah who has moved from one dysfunctional family to the other, alas from a yacht to a 'Kohli'. But her million expressions remain intact. Don't get me wrong. She is a fine actor but her big eyes are like Hrithik Roshan's nostrils, fluttering and fluffing a bit too much. Calm down, don't exhaust all your expressions. This is not your last film. Grumpy is your cool teacher with tattoos. There is a tattoo for everything. A cross. Oh, he is a Christian. Roman numbers tattoo on his chest. Oh Roman Catholic. A wild bird tattoo on the neck. MMA fighter hence established. That's not all. The director has very smartly dealt with Akshay's famous problem of forgetting his lines. He has engraved the films script all over his torso! Grouchy is Guru reloaded. He still seems to be on the sets of Ek Villain. Sidharth-now-available-in-a-beard-Malhotra has worked hard on his physique. And that's only fair. Who cares about body of work when you have a body to flaunt? There is tension between Cranky and Grumpy. It takes them 62 songs and 51 flashbacks to address what the issue is. It's an emotional story, I agree, but done so painfully slow that I could see Akshay Kumar's beard grow and turn white. The second half is like a WWF YouTube that never ends! It’s an MMF fight, a sport I don’t know much about. Educate me. Engage me. I didn’t care about hockey, but Chak De India made me fall in love with the national sport. We know both the brothers will reach the final and full sacrifice for bhaiyya will happen, emotions will run high, and scenes will be written to cajole a tear or two. But I knew Bhuvan and his team would win the match in Lagaan, yet I sat on the edge of my seat with my heart hanging in my mouth as that gora took the catch, thankfully beyond the boundary. In Brothers, between David and Monty, I cheered for the end of the film. I wanted it to get over so that I could go check out the sale in the mall. Our Grumpy and Grouchy looked so incompetent in front of the international line up of fighters. Against the Shaolin fighter, the Olympic winner, the MMA fighter, we had a Physics teacher and a fighter who has been a YouTube sensation. Errr what??? Jacqueline Fernandes looked gorgeous. She can emote too. Her unsaid mere suhaag ko chod de kutte expression towards the end of the movie is epic!! 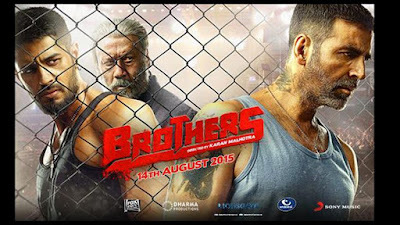 Brothers, despite being a powerful story, lost the plot in the telling. I suggest get a DVD of Warrior instead.